Search.socialmedianewtabsearch.com is the PUP that uses misleading techniques to prevent removal. Use Reimage to locate malicious components and get rid of them faster than with uninstall instructions. A full system scan blocks virus reappearance and prevents traffic to malicious domains. Search.socialmedianewtabsearch.com virus is one of those suspicious search engines that pop up on your browser unexpectedly and are very difficult to get rid of. Nevertheless, it is highly advisable to remove them from the computer as soon as possible, because keeping such applications installed, and using them for your regular search may bring some sad consequences. While Google, Bing or Yahoo are acknowledged and reliable search engines you can trust, this search engine may provide you with more advertisements and sponsored links than useful information. Users who had to deal with Search.socialmedianewtabsearch.com hijack report that this virus enters the computers stealthily and alters the browser’s settings by assigning http://search.socialmedianewtabsearch.com/ website to open as a homepage, default search engine and to load in a new URL tab. The users are then forced to use this website for their Internet search because this virus also installs additional helper objects, such as browser add-ons, toolbars, etc., which obstruct the browser changes to be reverted. If you do not wish to continue being redirected to this suspicious site, and want to get your usual Google, Bing or Yahoo browser back, you should remove Search.socialmedianewtabsearch.com from your computer without a delay. We recommend using a reliable antivirus software, such as Reimage for this purpose. What should also be pointed out apart from the Search.socialmedianewtabsearch.com redirect issue are the dangers of the Internet browsing when this application is installed on the PC. As mentioned above, this bogus search engine may inject different ads and links into its search results. The major problem is that the websites these ads redirect to are not always reliable or safe. In fact, the cyber security experts note that visiting such sites may result in computer’s contamination with additional viruses, Trojans, and worms. 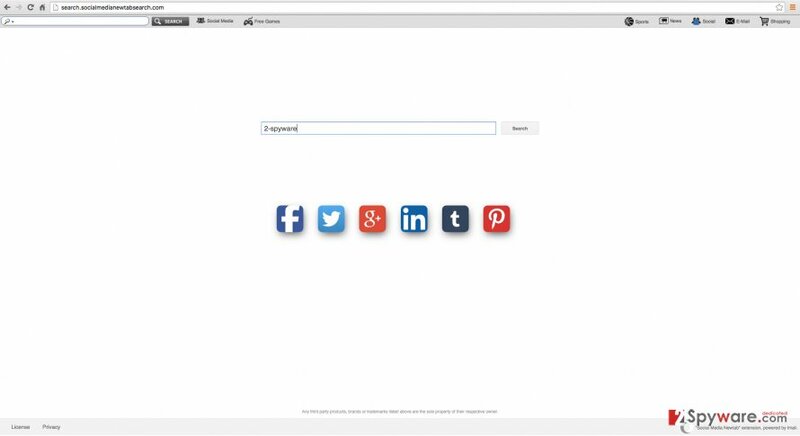 Also, typically to other browser hijackers, Search.socialmedianewtabsearch.com may collect non-personal information about your browsing habits: visited websites, viewed pages, your search queries, IP address, browser information, etc. Also, there is no guarantee, that your personal information is safe either. As it is unknown to what use this gathered data can later be put to, it is advisable to take care of the Search.socialmedianewtabsearch.com removal from your computer before such misuse of information even takes place. The ways through which Search.socialmedianewtabsearch.com virus is distributed is no different from other browser hijackers like Search2.myfileconverterxp.com, Social Media Newtab and many more. It travels with a help of deceptive software packages, containing the infectious file and some legitimate program which it uses as a disguise to get into the users’ computers. Unwanted programs are usually installed because the information about the optional installs in the software bundle is hidden within the “Advanced” or “Default” installation modes, which are, usually, ignored by users as they opt for the “Quick” or “Recommended” ones instead. However, you should always choose the advanced settings if you want to stop potentially dangerous programs from infiltrating your computer. Also, equip your computer with a reputable antivirus suite which will help you in keeping the viruses away from your PC. To know more about the removal of this browser hijacker, jump to second page. Search.socialmedianewtabsearch.com can be an annoying program to have on your computer. It may cause your system to work slower; your browser may crash or freeze as well. Therefore, Search.socialmedianewtabsearch.com removal from the PC is the best option to go for, if you want to browse uninterrupted again. We advise scanning your system with a professional antivirus tool and rely on it to remove the virus along with its components from the computer. If you prefer deleting the virus manually, or, if you are experiencing some troubles with the automatic uninstall, we have a solution. You can remove Search.socialmedianewtabsearch.com virus from your computer by following a step-by-step guide prepared just below this article. Here, look for Search.socialmedianewtabsearch.com or any other recently installed suspicious programs. Wait until you see Applications folder and look for Search.socialmedianewtabsearch.com or any other suspicious programs on it. Now right click on every of such entries and select Move to Trash. When in the new window, check Delete personal settings and select Reset again to complete Search.socialmedianewtabsearch.com removal. Once these steps are finished, Search.socialmedianewtabsearch.com should be removed from your Microsoft Edge browser. Here, select Search.socialmedianewtabsearch.com and other questionable plugins. Click Remove to delete these entries. Now you will see Reset Firefox to its default state message with Reset Firefox button. Click this button for several times and complete Search.socialmedianewtabsearch.com removal. Here, select Search.socialmedianewtabsearch.com and other malicious plugins and select trash icon to delete these entries. Click Reset to confirm this action and complete Search.socialmedianewtabsearch.com removal. Here, select Extensions and look for Search.socialmedianewtabsearch.com or other suspicious entries. Click on the Uninstall button to get rid each of them. Here, look at the Homepage field. If it was altered by Search.socialmedianewtabsearch.com, remove unwanted link and enter the one that you want to use for your searches. Remember to include the "http://" before typing in the address of the page. Now you will see a detailed dialog window filled with reset options. All of those options are usually checked, but you can specify which of them you want to reset. Click the Reset button to complete Search.socialmedianewtabsearch.com removal process. This entry was posted on 2016-04-11 at 02:13 and is filed under Stealing programs, Viruses. You can quickly scan the QR code with your mobile device and have Search.socialmedianewtabsearch.com manual removal instructions right in your pocket. How did you remove Search.socialmedianewtabsearch.com?